The latest and greatest cars are coming out with, if not completely made with, carbon fiber to reduce weight and keep the car strong. It has been used for quite a while now but sooner or later we will have to come up with something better....that's just what we as humans do. Something great comes out, and somebody made something better the day before. 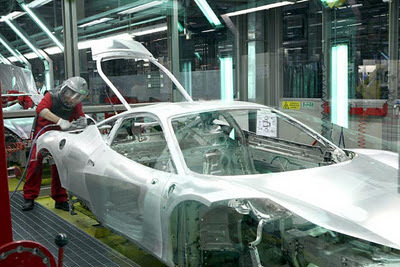 But at Ferrari, aluminum has been used for the same applications going back to the 1940's. Enzo Ferrari had a steel-framed sports cars wrapped in aluminum bodywork, as well as the race cars. Then in the 80's, they started looking into other materials such as stainless steel, Kevlar, carbon fiber, and aluminum. Then the research had stopped in 1995 with the F50 and 2002 Enzo supercars which had chassis made from carbon fiber. They started using preimpregnated carbon fiber where the fiber cloth is soaked in a plastic resin before it is laid out into the shapes needed to make the car. With a computer-aided design to engineer the structural integrity, Ferrari has been able to slim down the thickness of the sheet metal from 1.5mm to 0.9mm with potential to shave it down to .08mm. They started to utilize aluminum reinforced with ceramic fibers for a metal matrix composite that could cut the cars weight by 15-20%. 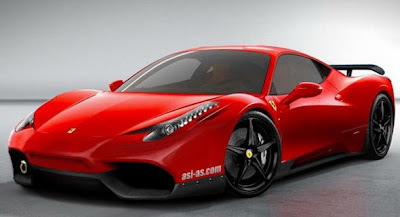 They are predicting that the 458 could weigh as little as 2600lbs.